“Slow is a philosophy recognising that time is precious and that rushing to try and fit more in is not the answer. On Monday morning, many Londoners initially panicked at not being able to get into work, but then soon gave up on the idea and took to parks and gardens to enjoy the snow with their children. 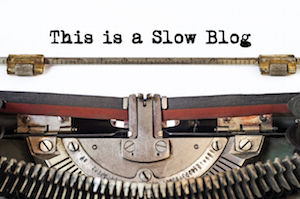 Slow is not about being slothful, lazy or ignorant. In fact just the opposite, it is about being mindful, aware and intelligent in your actions. When we are forced to slow down, downsize or change our lifestyle, we have a choice, we can get stressed, despondent and panic or we can use it as an unprecedented opportunity to embrace a Slow Philosophy. With more snow forecast, now is the perfect time to be slow. The Slow Philosophy is not about doing everything at a snail’s pace. It’s about seeking to do everything at the right speed. Savouring the hours and minutes rather than just counting them. Doing everything as well as possible, instead of as fast as possible. It’s about quality over quantity in everything from work to leisure time. A slow lifestyle manifests itself in different ways for different people, depending on their interests and experiences, but shared slow values include finding the right pace to do things. Appreciating, community, co-operation, manners and meaningful connections with people. Slow embodies the spirit of the tale of the Hare and the Tortoise – “Slow and steady wins the race” and can lead to people doing less and achieving more. A deliberately ‘Slow’ person tends to be more centred, relaxed and unhurried as well as being unrushed and unflustered. Acting spontaneously in the right way and at the right pace in a given situation. Learning how to develop a tortoise mind can allow people to increase focus and concentration, to relax and de-stress. They can become calm and collected, focus on the things they really want to get out of life and reconnect with life and appreciate the present moment. The positive effects of becoming ‘Slow’ can include improved health and energy, better sleep and even the ability to get control of spending and finances. I hope that Londoners enjoyed Monday and learned that there’s more to life than the seemingly endless rush. What they need to do now is learn to be slower and work smarter without relying on the weather to force it upon them.